I woke up at 9 today, later than I had woken up the previous days, and was mortified when I realized this would be 11 o'clock in Korea! How would I adjust going back?! 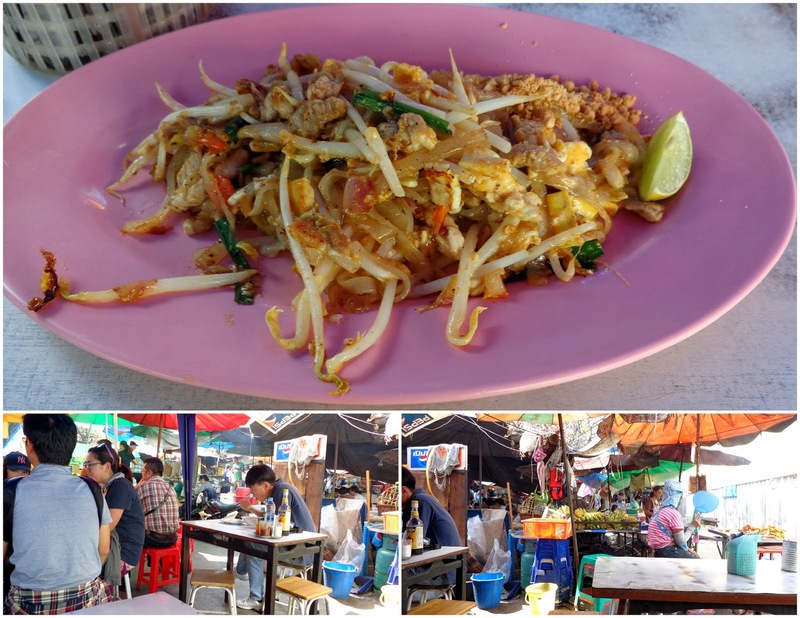 I ate breakfast out on the upstairs patio, while looking at maps and the little Bangkok guidebook to figure out where I wanted to go today. Stumbling upon Santiphap Park the previous day made me want to seek out a better green space today. 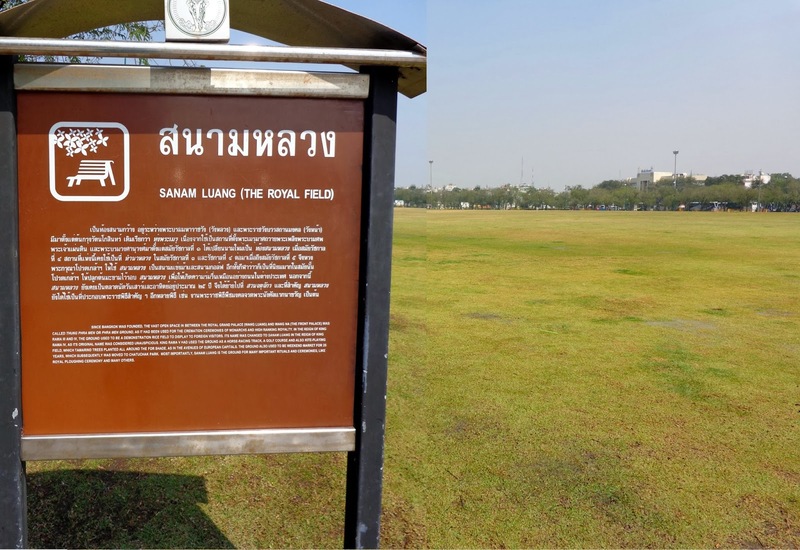 There was a page in the book with a list of 10 quiet retreats in Bangkok, so I decided to to try to find Sanam Luang (The Royal Field). I took a river boat again, but this time got off at pier 9. I walked around for a while under the heavy sun before I finally "found" Sanam Luang. I don't remember exactly what the book's 2-sentence description had said, but I remember something about it being a great escape from the city. I was not impressed when I got there; I was disappointed in fact. It was just an open field! Much smaller than I'd expected, and no shade in sight. The oval-shaped field was surrounded by roads on all four sides. Very visible roads, very audible traffic -- this was no escape from the city! I walked across the field and sat at a bench on the sidewalk by the road to read for a little bit. Then I walked back to the pier for some easy-to-find pad thai lunch. I got excited when the table next to me was clearly a table of Koreans because I heard them say the number "five" in Korean. Also, they had gotten a bunch of different dishes and put them in the middle, everyone eating from all the communal dishes in typical Korean fashion. 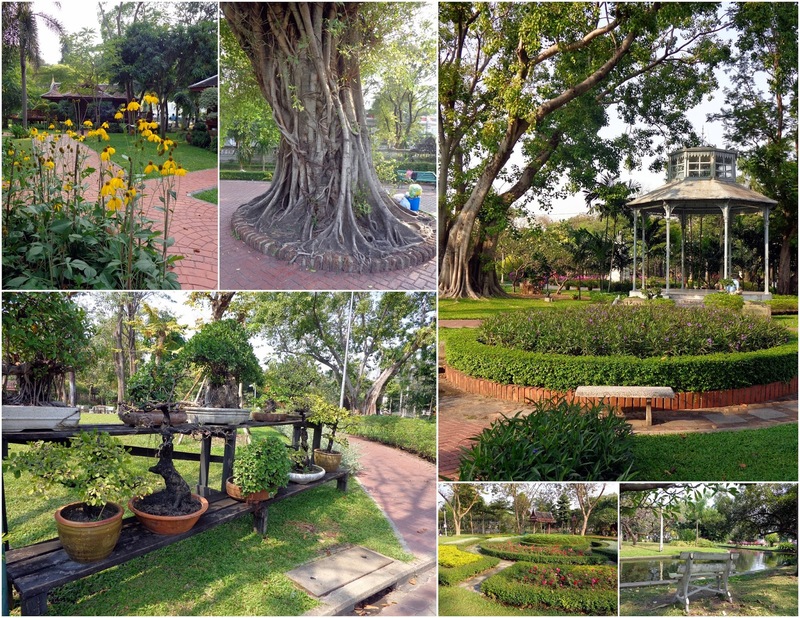 There was another park on that same page in my Bangkok book that didn't look far from where I was, so after lunch I walked past the Palace and found it without any trouble. It was the park I had been envisioning from the start. It was perfect! Green, flowers, benches, ponds, bathrooms. I set up shop on one of the benches and read until I finished my book! Then I wrote postcards. I definitely got a lot of sun -- but I had to soak it all up while I could. When my water was empty and the sun heat had taken its toll I walked to a nearby post office and mailed the postcards. I got another bottle of water from a 7-11 (I drank at least 3-4 bottles a day), and then bought some watermelon from one of the many fruit carts on the street. It was so delicious! Watermelon is waaay expensive in Korea, so I wanted to take full advantage of this delicious, fresh, cheap fruit while in Bangkok. It was early evening once again, so I began my journey back to the hostel. I went directly to the food street, this time sitting in a restaurant to eat instead of taking the food back with me. I got chicken curry and oh my goodness it was so delicious. And so much, it could have been two meals easily. The curry cost 80 baht and the rice 10 baht, so I paid $2.74 for that amazing meal. Unfortunately I have no picture to show even though I took a picture of the meal, nor do I have pictures that I took throughout the following two days. A memory card disaster took place on Sunday evening, which I'll write about in detail when I get there. Until then, please use your imaginations. I'll supplement the next two posts with photos from my friend Anne, who joined me in Bangkok that very night around 22:30. Somehow she was not tired after the day's travel, so we stayed up in the living room chatting with others until around midnight.